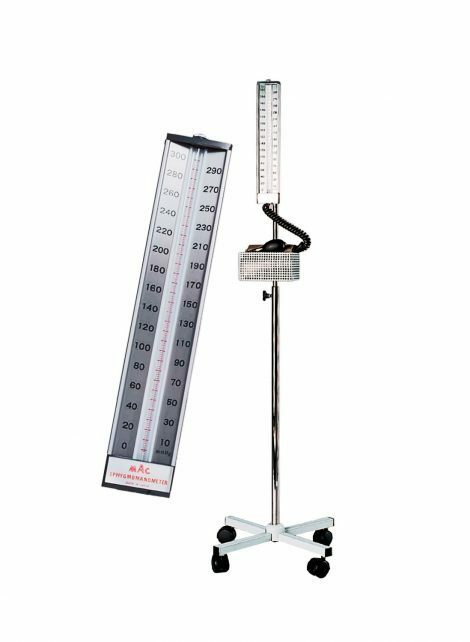 During a patients blood pressure examination, this Mercurial Sphygmomanometer by MAC brings stability and security with a four-leg trolley and built-on cuff-storage basket. The Mercurial Sphygmomanometer On 4 Wheel Trolley is the perfect tool for determining systolic and diastolic blood pressure. Built from strong die-cast materials, it’s housing delivers strength and durability, while its coiled tubing allows for up to eight feet of free movement, so that users won’t have to worry about flexibility. In addition, with a cuff storage basket built right on to the trolley, you will be able to have maximum portability, but with quick clean up as well. In addition, the mercury reservoir is lockable for fast, worry-free transport. The release valve is nickel-plated and this model comes with the cuff, bulb, bladder, and valves included. For maximum visibility, this model also has highly visible graduations marked in red and a telescopic pole for convenience.